Everybody always talks about getting toned, but what does it really mean? How can you tell the difference between muscle tone and bulk, and what are the different types of workouts that will get you toned without looking bulky? In this blog post, I’ll explain the difference between getting toned and getting bulky. Being toned and “toning up” up your body are very common fitness goals. But there’s no proper definition for it. My idea of being toned can be quite different from yours. Your friend may think she looks too muscular and bulky but you may think she looks amazing and toned. That’s totally ok, but it can cause confusion! So I’ll try to give you a general explanation. Usually, when people say they want toned body they mean they want a lean, slim body. Victoria’s Secret models, ballet dancers, and aerobics instructors often have this look. If you say you want to tone up, you probably mean you want to look leaner with some nice muscle definition. In my experience, men are much more likely to want to bulk up, while usually women want to tone up. Just like with toning, there is no real definition for bulking, but it always means increasing one’s muscle mass in some form. For some people, bulking also requires lowering body fat, but it doesn’t have to. When you think about bulking up, you can picture rugby players and bodybuilders. They’re big, they’re strong, and they are usually male. For most women that I have come across, bulky is defined as having too much muscle for their liking, particularly in the shoulders and legs. Of course, some women want to get bigger, and that’s fine! It’s just a matter of personal preference and no one should be judged for the way they want to look! The same goes for women that prefer a slimmer, more feminine look. If they want to be leaner, they shouldn’t be pressured to build more muscle than they would like. I WANT TO BE TONED, NOT BULKY. WHAT SHOULD I DO? When I first got into fitness, I also wanted to get toned but I wasn’t sure exactly how to do it. I was doing mostly cardio in the beginning and didn’t really have a resistance training routine. You see, cardio is great for reducing overall body fat and for keeping you slim but it doesn’t build enough muscle for you to get toned. If you want to get toned, you need to build some muscle and you cannot build muscle if you avoid resistance training. Resistance training also helps to reduce body fat so it’s a win win. When I realized this, I started doing weights as my resistance training. At first I was super happy about my results. I was still slim and I finally got toned (with proper abs too). But as I started lifting heavier and heavier, my legs became too muscular and my back became too broad for my own liking. At that time I didn’t know my body type and I didn’t realize that lifting heavy and doing a high number of reps would make me bulky instead of lean. But now I know exactly how to achieve my fitness goals and get lean and toned. Here’s what I suggest you do if your fitness goals are similar. Your body type is going to be the basis of how you should exercise and how you should eat. Understanding my body type was so important for getting the body I had been working so hard to get! There are three different body types. Each one is going to respond to training differently. For example, mesomorphs (my body type!) naturally have an easier time building muscle than ectomorphs. If you train inappropriately for your body type, you can end up getting bulkier than you meant to (like I did!). 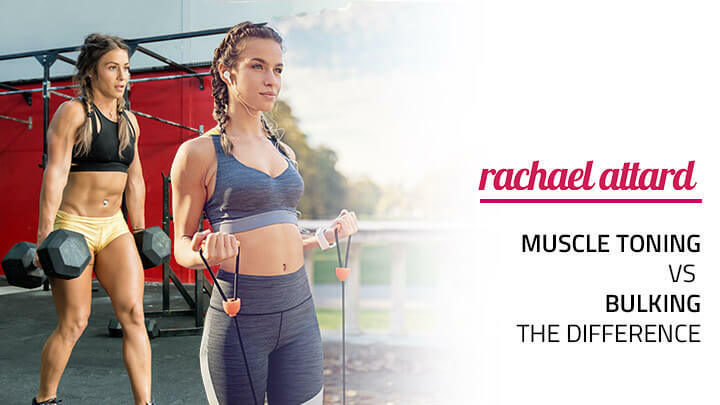 Take my free quiz to learn your body type and a little bit more about how to train and eat for your type! 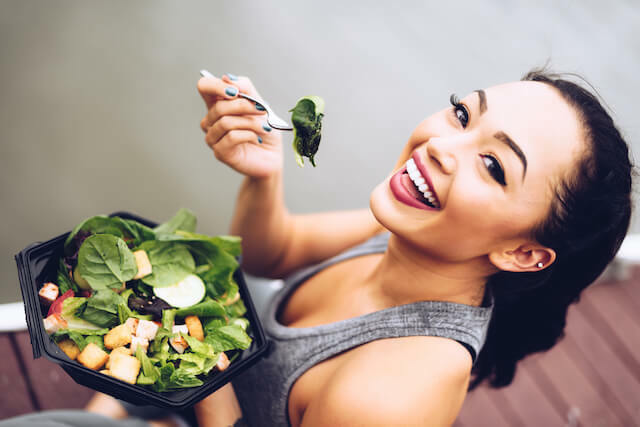 If you want to be toned, you need to make sure that you eating a healthy diet. That way, you’ll reduce body fat (if you need to) and you’ll keep it off. Learn how many calories you should be eating in a day. Track your calories for a few days to make sure you’re eating enough. You don’t have to do it constantly. But it’s good to know that you’re eating enough for your body type, age and activity level. Both eating too much and eating too little can mess up your progress. Check out what I eat in a day for some basic guidelines. Eat plenty of fiber and protein. These will help you stay fuller for longer! Cardio is great for losing overall body fat and for improving your fitness level. I’ve found that walking is great for slimming down my thighs, but I also enjoy boxing and running. If you’re unhappy with your weight and you have extra body fat, you should be focusing on reducing overall body fat. 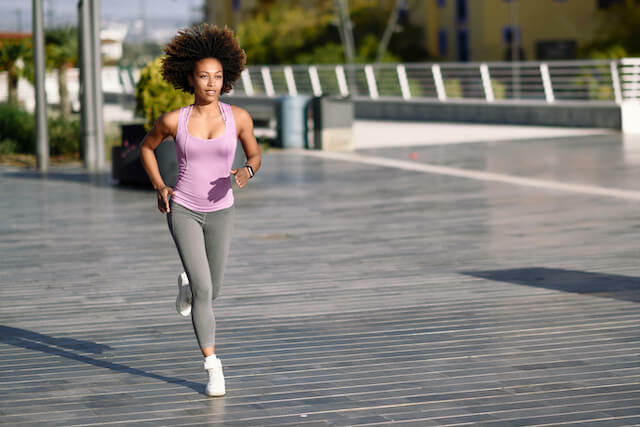 If you’re already slim or if you have a body type that doesn’t gain weight very easily, then doing lots and lots of cardio without any type of resistance training might just make you look skinny fat. Ok, so this one goes for all body types. It is easy to get scared of resistance training because people usually associate it with lifting heavy. And lifting heavy is usually associated with bulkiness. But you don’t have to do heavy weights to build muscle tone. There are other types of resistance training that will help you get lean. If you want to avoid bulkiness, try bodyweight training or lighter weights with high reps. And the key is choosing the correct exercises. Some exercises (such as squats and overhead pressing) can cause bulkiness, especially for endomorph and mesomorph body types. Remember, toning requires some muscle definition. Most models who are in great shape have a definition in their abs, legs, and arms! They get that look through bodyweight resistance training, pilates, and similar exercises. 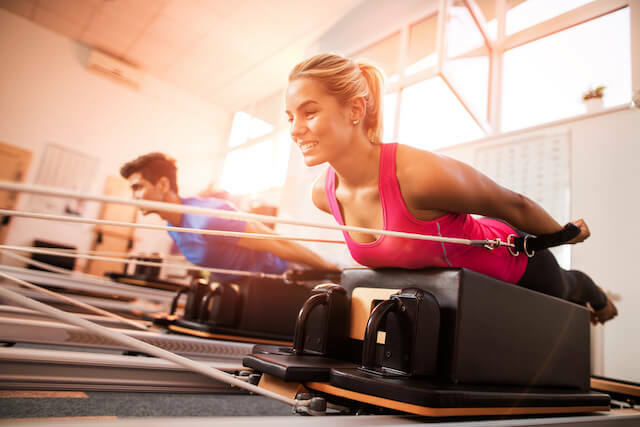 PILATES STYLE WORKOUTS – You can try mat pilates, reformer pilates, or even barre-type workouts. Make sure you aren’t overdoing it though, especially if your classes have lots of squats, squat jumps, squat holds or burpees. BOXING – I love doing boxing because it gives me both cardio and resistance training in one session and it works my whole body. I usually notice results quickly in my arms and abs with boxing. Victoria’s Secret models like Gigi Hadid and Adriana Lima are also huge fans of boxing. This full body resistance workout. This workout for lean legs. This toned back and arms routine. SHOULD I DO RESISTANCE TRAINING EVEN IF HAVE EXTRA BODY FAT? Yes! Cardio will help you lose fat and get a slimmer look, and resistance training will help you build muscle tone and reduce body fat. You can also do some power walking after your resistance training. It is beneficial to do cardio after a resistance training session because this type of training uses up your glycogen stores. This means your body will use more fat during your cardio workout (for more information on this, check out my previous blog post on cardio). HOW DO I AVOID GETTING BULKY? HIIT is great! It burns tons of calories and it boosts your metabolism so you keep burning calories even after you’re done working out. But, depending on your body type, HIIT workouts that have a lot of squats, lunges and burpees may cause you to bulk up. I’ve had lots of women complain to me about this so I created my own HIIT routines that shouldn’t make your thighs bigger. Personally, I noticed that my legs got too muscular after lots of heavy squats and deadlifts. So, if you are a mesomorph or endomorph body type, lifting heavy weights will probably bulk you up. I loved doing Crossfit, but it made me bulkier than I wanted. If you’re an ectomorph, you can probably do Crossfit without getting too muscular. But for other body types, it might be best to avoid it. These are popular at the gym, but they will engage your quads and probably make your thighs bigger rather than slim them down. 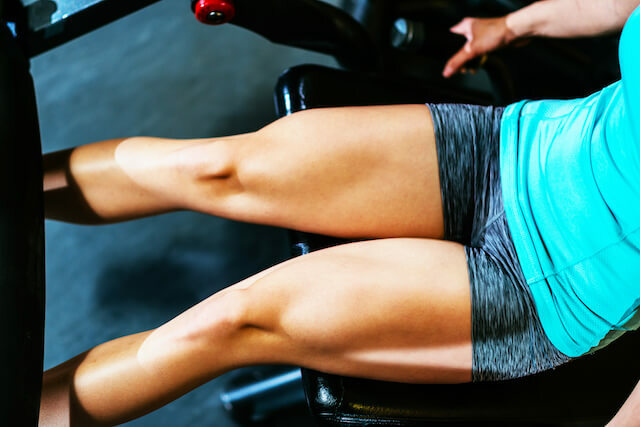 If you don’t want to grow your thighs, it may be better to avoid these and other types of machines that target your quads. It will probably make your legs bigger. I prefer interval running and walking/running on a flat surface. I also wrote about some other workouts that can make you bulky and you can read that blog post here. I should also mention my 3 Steps to Lean Legs Program which I designed after talking to so many women who got bulky like I did. There are three versions of the program, for each body type so you can be sure you’re working out according to your body type. It combines cardio (that will help you reduce overall body fat) with the resistance training that will give that lean and toned look. And of course, it has a complete 8-week meal plan so you don’t have to worry about whether you are eating right.